The culture of Costa Rica is rich and varied recognizable by having indigenous, European and Afro-Caribbean influences; this is a mestizo, multi-ethnic and multicultural country. The culture is manifest themselves through gastronomy, folklore, music, traditional dances, beliefs, superstitions and popular language. The Catholic religion as a cultural Spain heritage, has an emphasis on the family, thus influencing the lifestyle of the nation, reflected in full of colourful festivals in honour of the patron or saint of each place. The Spanish is official language, as so stipulated in its constitution, but there are others idioms such as the Maleku, Bribri, bocotá and also the English. Costa Rica celebrates life, both human and nature in general; this country has multiple initiatives to innovative sustainability that protect their rainforests, the forests and the biodiversity; while the absence of a standing army reflects the country?s commitment with peace. It is a unique place to enjoy the "Pura Vida", is a phrase that the locals use for all, greetings, say thanks or even to express something that likes much. In a land of lush natural landscapes, mouth-watering culinary traditions; according with an article in Wikipedia about the Costa Rican cuisine, Costa Rica has three major influences for the preparation of their dishes are Aboriginal culture, Spanish culture and African culture. 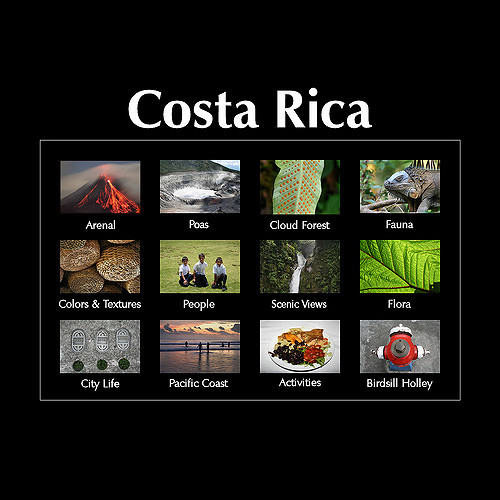 In addition, Costa Rica has a thriving arts scene, it is no wonder that Costa Ricans are known to love life. This small country located between the Caribbean and the Pacific coast is also known for its fresh seafood, along with fresh fruit, bananas and coffee. The most popular sport is football and national team matches are events mostly followed by Costa Ricans.